As a wargamer trying to build a new set of city terrain, miniature painter with tons of unpainted Reaper Bones sitting around, or Dungeon Master with writers block, sometimes it takes a little extra push to get the brain-juices flowing enough to set aside time to continue your projects. Often because your projects require you to access the Creativity part of the brain, and yet also require you to buckle down and get the Productivity part of the brain going. For instances like this, I have invented something that will revolutionize the way you do game prep. Here's the idea behind its formulation: as is well known and researched thoroughly by well-respected agencies, alcohol sparks the creativity neurons in the brain to let loose their inhibitions and think about stuff like spaceships and sorcerers. On the other hand, caffeine sparks the productivity part of the brain to get you to pick up the pen or paintbrush and start working and maintain focus on things you need to get done, like corporate spreadsheets and TPS reports. So in a flash of genius, we here at VC Labs thought... "Why not combine them?" I call it: Cyberninja's Cyberstonishing Producto-Creativity Juice. 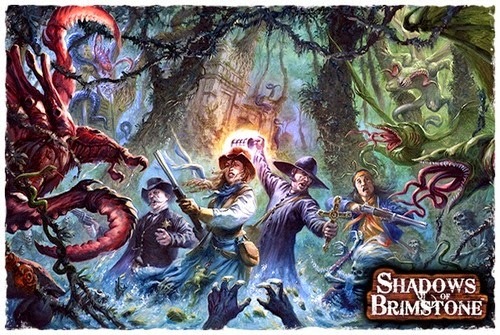 Playtest: Shadows Of Brimstone - Swamps of Death! 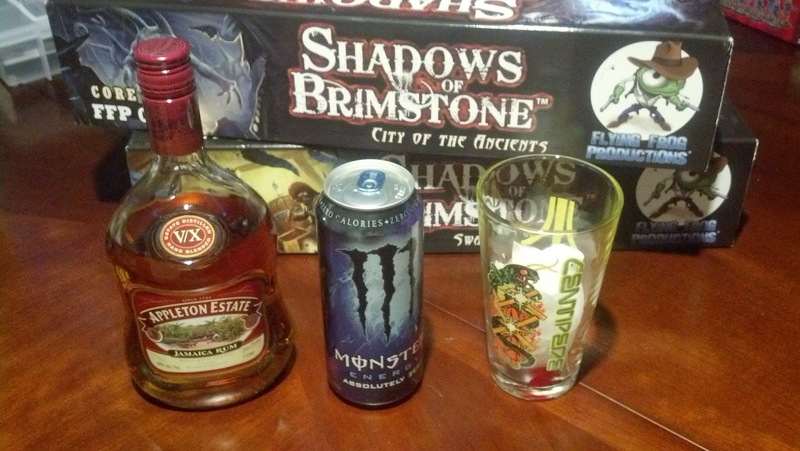 At GenCon this year I picked up Shadows of Brimstone. A Kickstarter'd game by Flying Frog productions which just barely got its Core boxes out the door before the convention. Premise: Its 1869. Prospectors found a magic crystal called 'Darkstone' in some mines that everyone wants. Naturally they 'dug too deep' and opened up evil portals to alien dimensions. Now monsters stalk the mines and countryside, eating livestock and kidnapping folks. Is your posse of cowboys bad enough dudes to rescue the president?